Brian Badder, who graduated from Tidewater Community College in 2013, has been in the Navy for 13 years. The lead chief petty officer for SEAL Team 18, the Virginia Beach resident will leave the service this fall, and he will be looking to establish a civilian career. Which makes him a candidate for The Honor Foundation, the first-of-its-kind transition institute for the Naval Special Warfare (NSW) and U.S. Special Operations Forces (SOF) community. Founded in 2012 in San Diego, The Honor Foundation is setting up shop on the East Coast at TCC’s Virginia Beach Campus. “I’m looking for a sense of direction,” Badder said. “There aren’t a lot of programs for guys like me.” He applied to be in the first group of fellows and is hoping to be accepted. 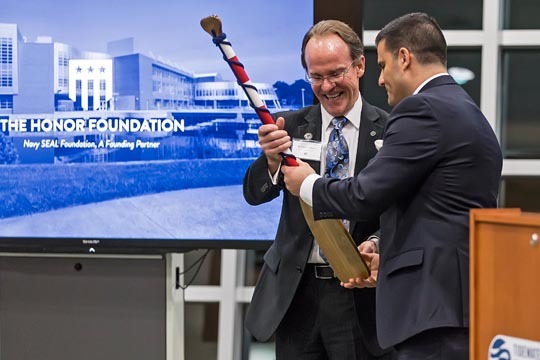 A kickoff event on Jan. 28 at the Virginia Beach Student Center marked the establishment of The Honor Foundation at TCC. Among the guests were Virginia Gov. 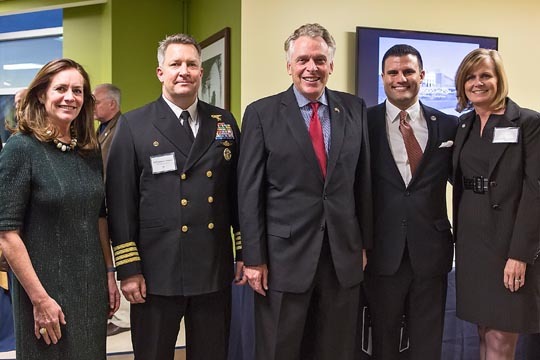 Terry McAuliffe, First Lady Dorothy McAuliffe and John C. Harvey, Virginia’s secretary for Veterans and Defense Affairs. TCC President Edna V. Baehre-Kolovani appeared on a video to welcome the Foundation. About 100 guests attended, including dignitaries, college officials, business representatives and members of Special Forces. Joe Musselman, CEO of The Honor Foundation, was an aspiring SEAL who was sidelined by an injury. He said he was inspired to launch the organization after speaking with hundreds of Special Forces operators who had plenty of education, leadership experience, personal courage and integrity – but who were lost at sea when it came to post-service plans. The Honor Foundation has attracted powerful support, like that of founding partner the Navy SEAL Foundation. It admits cohorts of students both near their transition from Navy careers and those currently out of the SOF community. Faculty members take them through several months of twice-a-week classes, helping them translate their military experience into valuable job skills. They are assigned mentors, taught how to network and assisted in their job searches. “The least we can do is to serve those for 12 to 18 months who have served us their entire lives,” Musselman said. He said over 130 members of the NSW community will be served in 2016. Jeff Pottinger, who taught strategy, leading change, and influence and persuasion for the University of Virginia Darden School of Business executive education program, is the chief of curriculum and Virginia Beach community advisor. The classes will be held in the Virginia Beach Campus Student Center starting in April, said Provost Michael Summers. TCC is donating the facilities. In appreciation, Musselman presented Provost Summers with a Honor Foundation paddle.